Would you like to try to win a copy of Total War: Shogun 2? It's easy and you get a hands-on look at the game. 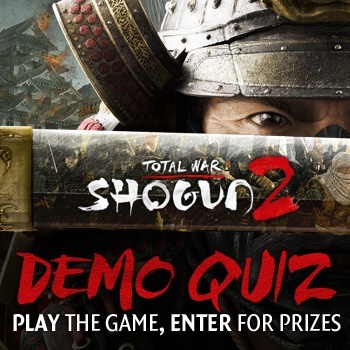 Play the demo, answer our questions and enter your name into a random prize drawing for one of two copies of Total War: Shogun 2 for your PC! It is the middle of the 16th century in Medieval Japan. The country, once ruled by a unified government, is now split into many warring clans. The player takes on the role of one Daimyo - the clan leader - and will use military engagements, economics and diplomacy to achieve the ultimate goal: re-unite Japan under his supreme command and become the new Shogun - the undisputed ruler of Japan. Set during the golden age of Samurai warfare, Shogun 2 brings to life the most turbulent period of Japanese history. And we have 2 copies to give away! You must be 13 years old and currently reside in the United States to participate. For more details on how to enter, click here and good luck!